Global Architecture and Benchmark. This includes the development of the overall AMASS reference architecture (WP2) and the Industrial Use Cases for evaluation of results (WP1). 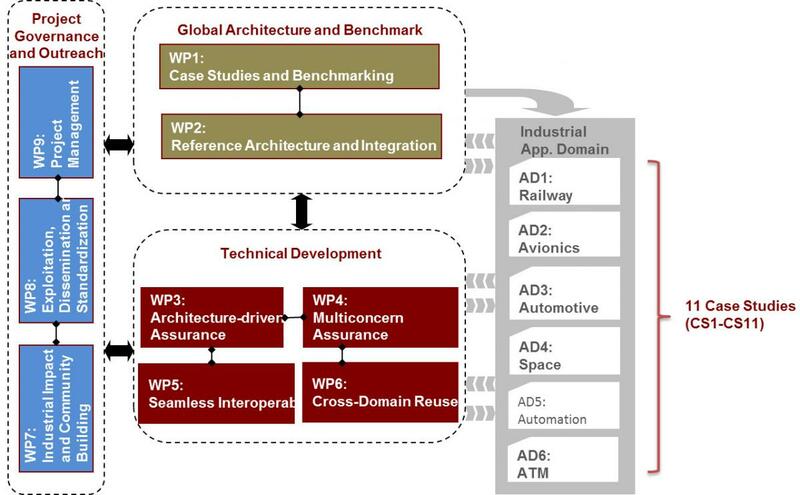 WP2 also co-ordinates the integration work of the technical work packages, ensuring that all the methods and tools form a coherent and usable whole. Industrial Case Studies (CS1-CS11) will also provide feedback to the technical development of the project. Technical Development. It is in WP3-WP6 that the core technical R&D work of the project will be carried out. All the AMASS meta-models, methods and tools are developed in these technical work packages. Project Governance and Outreach. WP7, WP8 and WP9 provide general support for the other work packages. WP7 defines the main industrial outreach strategy and the AMASS community building maintenance. WP8 targets exploitation, training, dissemination and standardization of project goals. WP9 contains main project management and reporting tasks, including project management activities for the consortium partners and the project coordination activities. The Technical Committee (TC) is responsible for the daily operation of the project, taking and implementing appropriate decisions. The overall management responsibilities are summarized in the table below.